Well I talked with my partner this weekend and we agreed to simply use a larger tile on the shower floor. I didn't trust myself to make a mud bed myself, and honestly, after the day I had removing thinset from the slab, I'll take what I can get. The guy at the tile shop/supplier said Schluter doesn't recommend anything smaller than 2x2 -- which I am pretty sure we can find a tile that we like that'll fit that bill. Now on to leveling this slab. I picked up two bags of Laticrete NXT Level and some primer (Can't there be a smaller jug!?). I can't imagine this being more than 1/8" out of level, but what do I do about the wall's bottom plate on the slab? 1) will this stuff run under them into the adjacent room? 2) Do I need to build up a dike, for lack of a better word, to protect the bottom plate? I’d caulk where the bottom plate meets the slab. Any cheaper acrylic caulking will do. Just something to prevent the self leveler from running underneath. You could also tack some sill seal foam gasket to the front of the bottom plate to provide an expansion joint. Well I've got this thread going, thought I might as well ask another question, unrelated to the thread. I'm being told I need an air barrier behind the exterior wall side of the shower; so I thought of a foam board. I'm also being told if I use a foam panel for this, that I have to take into account flame exposure. The standard thermal barriers are 1/2" gypsum or 1/4" cement board. I have only 1/2" total to work with from the studs to the pan. I'd like to use a foam board because the idea of a polyethylene sheet behind the gypsum I want to use makes me nervous: I picture moisture condensing on it and ruining the gypsum. I'd rather not use cement board if I'm using kerdi membrane: I've heard it's pretty stubborn to work with since the board really wants to soak up moisture from the thinset. Does anyone have experience with this? What combination if air-barrier, thermal barrier and ease of putting up kerdi would you suggest? Who is telling you this, Gardner? Did they 'splain you just what they might have meant by "behind the exterior wall?" 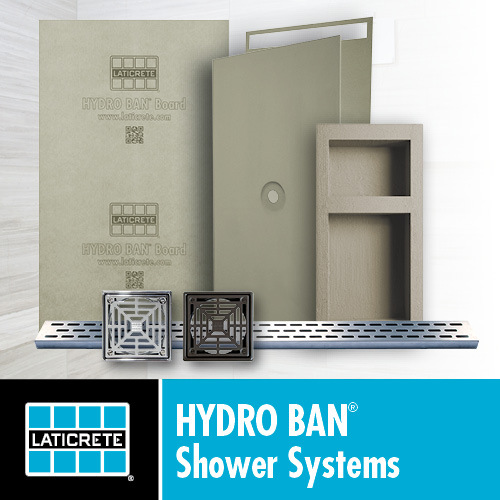 The shower wall must have either a moisture barrier behind the wallboard or a direct bonded waterproofing membrane on the face of the wallboard. Since you have elected to use the direct bonded waterproof membrane (Kerdi) and gypsum drywall as your wallboard, you must not install any serious vapor retarder behind the wallboard on the inside of the exterior wall. That would be regardless your climate or type of construction. If the somebody is recommending an air barrier, it would normally be installed on the outside of the exterior wall of the structure and would not be a vapor barrier material. CX, you answered my question, but I wanted to be clearer just in case (more information is never a bad thing). I'm being told I need an air barrier behind whatever board I put up on one side of the shower (that side is on an exterior wall). I am 100% with you on the waterproofing membrane: if it is indeed waterproof, then any air barrier behind the wall board would be detrimental. I'm thinking this is a case of the permit person working in their world, and the inspector working in theirs. The inspector will have seen these waterproofing membranes for years and knows where they fit in regarding code. As a plus, the permit folks in my county have been nothing but gracious, so I've got that going for me. Last edited by gardnert; 10-10-2018 at 08:32 AM. then any air barrier behind the wall board would be detrimental. You sure we're not mixing terms here? An "air barrier" might not be problematic, but a vapor barrier/retarder certainly would. An air barrier in that location (immediately behind the wallboard) would also be of no real value at all in the grand scheme of exterior wall construction. Have you spoken with the inspector who will be inspecting this work? Last edited by cx; 10-10-2018 at 08:44 AM. This is the path I'm heading down now. I've been communicating with the permit person -- it's easy because we're both in front of computers, and can do this over email -- but in the end it's the inspector I have to get the OK from. I'll schedule a visit, chat with them to see what all they want to see, and go from there. This is quite the learning experience; luckily I've not hit the wall. . . yet. In fact, an air barrier in the wall cavity is desirable to maximize insulation value. If you use fiberglass, then you want to air-seal that cavity where it meets the outer sheathing. Something like a simple bead of silicone around the perimeter suffices. Air movement through fiberglass reduces its insulation value. If you use spray foam, then that's an air barrier in itself. An insufficiently insulated cavity even behind a waterproof shower might cause condensation in your wall during the cold season. This is sort of the path I'm going, I think. Stopping the air movement without using a sheet of plastic. What about cutting rigid foam insulation to fit tight in the stud bay, then caulking the edges to the studs? Depending on the thickness of the foam I could even put fiberglass batts back in the space. Y'all have been such a great help with my Kerdi shower tray question, why not seek help involving the support under it? I used a trowel to push it around to the corners, and around the shower drain section/cutout. I feel like I did as good a job as I could have, with maybe 10min between bags. The floor is pretty smooth, but not level I almost feel like I am in a worse situation than before. I can deal with the bathroom floor being not level and for all intents and purposes, it feels like it is, but since I've learned the slope on the Kerdi tray is only 1/8", that part of the floor needs to be dead level. This sounds like an idiotic question but: do self leveling materials actually make a super level slab? or just a super flat slab? The plan I'm running through in my head is to dam off the section of the floor that will have the tray and curb and repour another bag (or less). I've also got an angle grinder and diamond cup (from earlier in the project) and thought about knocking down the high points, but that seems harder? I could lay down some deck mud but the minimum depth is what, 1"? Thanks for any insight, and ridicule away with my leveling comment: I can handle the abuse. Last edited by jgleason; 02-11-2019 at 06:20 PM. Gardner, it'll help if you'll keep all your project questions on one thread so folks can see what you're working on and what's been previously asked and answered. A moderator can give it a more generic title any time you'd like to suggest one. Your self leveling question is very reasonable one. Self leveling compounds, being liquid when placed, will try to seek level as do all liquids, but they are only fluid enough to actually do that when poured in thick sections. But even at that they may not achieve actual level nor even really flat without quick installation and some mechanical manipulation. Regardless the fact that you've paid a dramatic price for that piece of foam, I'd still recommend you abandon it and make a properly sloped shower floor from deck mud, which you can do over your current subfloor without any need for any leveling. I concede to your point: I'm going to go ahead and work on a mud deck for the shower. As a plus: my partner can get her penny tiles back in the shower floor! A quick question about the mud mix: just simple Portland cement and play sand? Thanks, y'all for all the help. I'm not on to the actual tiling yet, I'm sure I'll be back with questions for that. Well it's been a while and things have been moving: slowly, but moving. I have put up the drywall in the bathroom. Taped the corners, and mudded as much as I'd like only in the places that won't have Kerdi on them. I read on another post to not use joint compound anywhere the thinset will be present: I sure hope that still stands true because I'm already super tired of working with joint compound and sanding. My question does involve this aspect though. I plan on running Kerdi membrane from floor to ceiling. The top ~2" of the walls have the corner tape and the minimum amount of joint compound to hold it there. Is there any prep I could do to make sure the thinset and Kerdi stick well on those sections? Here's a picture of one of the shower corners. Mudded on the ceiling, "not" on the walls. Some people recommend a paint primer over drywall compound when applying thinset mortar, but I've found that the Kerdi will bond just fine in applications such as I see in your photo. I'd just Kerdi what you've got. Other thoughts: I wonder if the plumber meant, the curb top needs sloped. It does. As does anything else in there. I like the schluter tray so far, 2 of them have gone well. Think 3 times about setting your drain and how all that works. Schluter support is very helpful. Make sure you use the right bonding cement for the flange.